The anticipation leading up to today was indeed high. Even though Pippa has had a wonderful time over the past 3 days on our Palm Cove holiday, she was terribly excited about today, “Her Wish Day”. And she was not in the least bit disappointed. The weather was absolutely perfect – 30 degrees and crystal clear turquoise water of glass. The Quicksilver Outer Reef staff were expecting her and they treated her as the VIP she deserved to be. 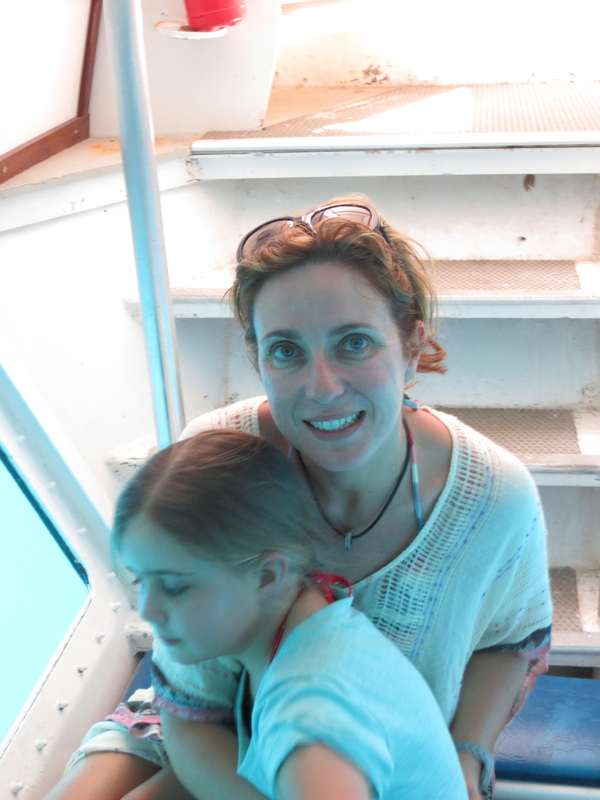 The underwater observatory and a ride on the semi submersible where we saw turtles and a reef shark prepared her well for her snorkeling experience. At first it was difficult. Combining the breathing with the deep water and the vast ocean to eventually overcome natural trepidation took a little perseverance but Pippa was determined. Quicksilver and Make-A-Wish had organised a marine biology snorkeling tour which was amazing. 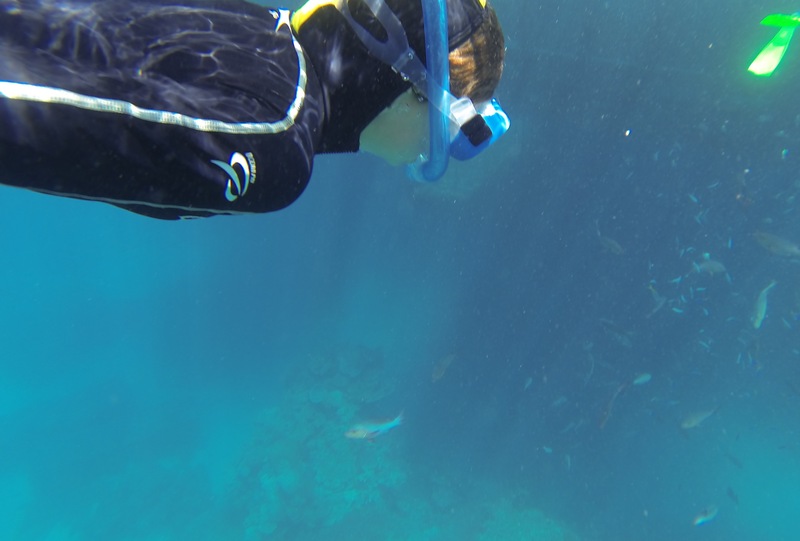 In my previous life I have been to the reef many times but to snorkel alongside my children with a marine biologist explaining the different corals and fish was truly special. Our guide would dive down and point out special fish and corals to look at and do it all whilst wearing a Go Pro for us so we could bring home our own memories. Thank You Make A Wish and Quicksilver. Suited up – sun protection, stinger protection, sea lice protection and looking oh-so-fine! 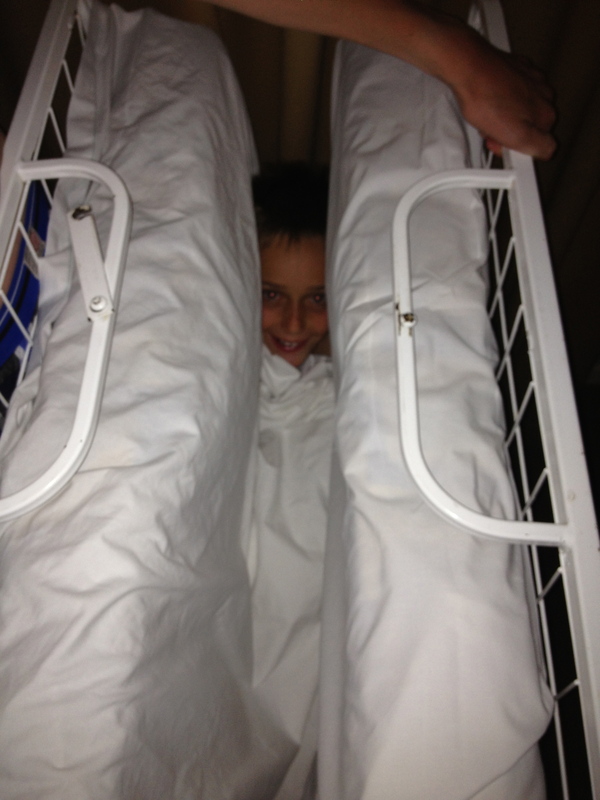 What do 3 children do after a long and tiring day snorkelling on the Great Barrier Reef?…………..
James & Patrick; fold each other up in the rollaway bed! And yes, it did close all the way! 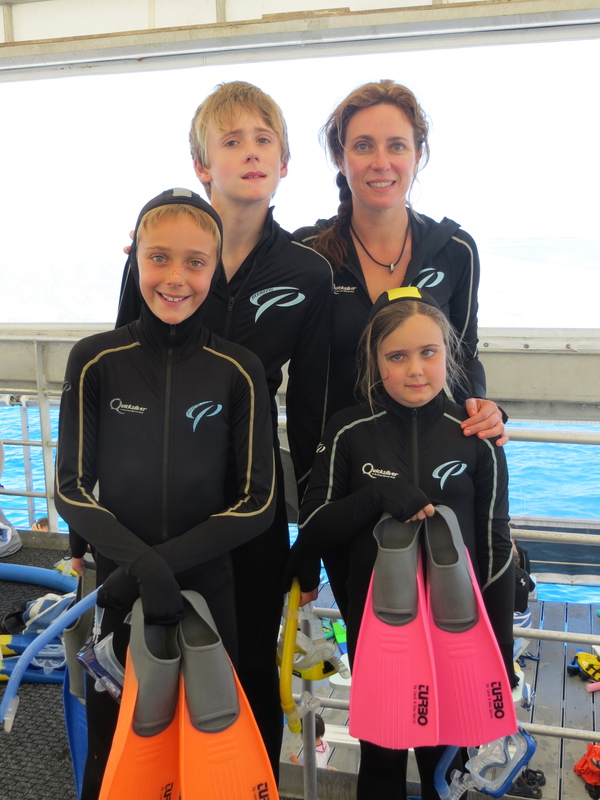 On Tuesday Pippa was granted a wish from Make-A Wish Australia. The local branch delivered the wish to her and although she didn’t have a lot to say at the time, she woke up Wednesday morning and hasn’t stopped talking about it since. Tomorrow morning we fly to Cairns for a week staying in Palm Cove so Pippa can live her wish and snorkel with the fish on the Great Barrier Reef. Our whirlwind life continues. A crazy mix of highs, lows and lots of in betweens. It will be wonderful to be in some hot weather, enjoying the beach and some amazing adventures. We will create some more wonderful memories and I’m sure that snorkelling on the reef will be an experience Pippa will always remember. I am currently the laughing stock of my family as my wish is to just lie on the beach for the entire week and be rotated every now and then; my children’s wish for me is that my memory returns! Pippa has returned to school this week and I am busy tying up 100s of loose ends from my life prior to 26 June along with planning our future routine. We currently have a month off major medication although the radiation is still actively working in her body for another 2 weeks. In October we commence 12 months of intense chemotherapy. We will continue to travel to Melbourne for check ups, specialists, scans and to collect the drugs. Fortunately, the medication can be taken orally which hopefully means minimal disruption. My children and I are fortunate to have so many people caring about us and I am extremely grateful. It is evident to me returning home how important it was for James and Patrick to be able to continue with a normal routine. The support Pippa and I had in Melbourne made our life away from them so much easier. I am so lucky that I have friends and family in both locations. I often thought and also commented that it would have been much harder had we relocated for 7 weeks to a place where we knew no one and had no support. I know that is the situation for many people who have to travel long distances and interstate to receive specialist medical treatment. It must be incredibly difficult and daunting. Hit him for six in cricket! And she did – right over his head! I didn’t buy Dad a bottle of wine, a block of chocolate or a pair of socks; I just said, “Happy Father’s Day Dad, here’s your grand daughter.” We ate fish and chips and packed the cricket bat and tennis ball. Never one to not give sport a go (nor for that matter, not be good at it), Pippa picked up the bat, walked over to the pitch and astounded us all with her ability despite her double vision and having just completed week six of radiation. The main event this weekend was actually supposed to be James and Patrick going to the footy. I have been very mindful that even though they’ve been able to stay at home in their own space during all of this they have still been very displaced and thus I wanted to arrange something special for them. They had been given tickets to the MCG on Saturday night and each took some friends on the (Warrnambool Essendon Supporter) bus down to watch the match. The excitement leading up to the departure on Saturday afternoon was almost unbearable. For Patrick going to watch Essendon was just bliss, but for all of them they were equally excited about 6 hours on a bus with mates and arriving home at 2.00am. Last week Pippa had some special visitors from the west – one bearing a task of naming some future greyhound champions which Pippa aptly did, the other (my sister) living in our apartment and bearing personal training sessions for me at every opportunity. It became harder as the week went on to reach up to close the curtains every night! Thursday saw Pippa fitted with some glasses containing stick on prisms to try and see if we can encourage a bit of movement from her left eye. It’s a guessing game really as the extent of the nerve damage and thus whether there is to be any recovery at all is still unknown, but even trying to teach the brain to talk to the nerves again is worthwhile. Although watching her hit a cricket ball and you wouldn’t even know there was any problem with her eyes at all! Walking through the hospital she was lucky enough to meet a celebrity……….the Dulux Dog!!! A visit from cousins earlier in the week meant games, lunch in the park and the girls got to join in on some Taylor Swift jamming in music therapy.